When it comes to Wall Street, men in suits is the first thing that often comes to mind. When it comes to fashion, ugh… not so much. Yes, very stereotypical of us to treat men as second-class citizens just because they’re ‘simple’ shoppers. That’s why I am excited to inform you that Coach will be catering to men. 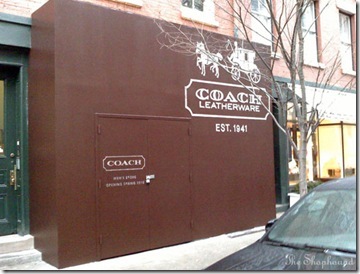 The first Coach men’s store has opened at 370 Bleecker Street in Manhattan, also known as the village. The new mens’ platform incorporates many Coach signature elements tweaked in a masculine way. 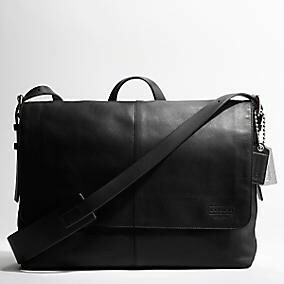 They offer merchandise like the business messenger bag, what I like to call the man-bag, premium leather belts along with the trendy avant-grade boat shoes. The ambiance of this store is also very masculine. Its decor consists of dark mahogany, dark brown shelves and industrial ceilings. I’m calling it Abercrombie meets Marc Jacobs. The casual feel of Abercrombie with the quality and price point like something you would find from a Marc Jacobs’ collection. In the world of fashion, looking for a new niche-market is always on every marketing-gurus agenda. Finding a way to bring attention to a less acknowledged shopper, like men, is something this economy needs. Coach plans to expand within the U.S. and eventually globally. I sure wouldn’t mind seeing more men’s specialty stores. Prada Men’s??? We’ll have to wait and see.